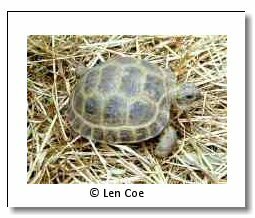 This site is dedicated to the wonderful Russian tortoise, Agrionemys horsfieldii. It was originally classed as a Testudo sp. but recently was given its own genus Agrionemys (Ananjeva et al. 1998). More recent studies place it back in the Testudo genus. They are known by many names...... Russian tortoise, Steppe tortoise, Afghanistan tortoise, Four-toed tortoise and even Russian box turtle. It is found in Afghanistan, Northern Pakistan, Northern and Eastern Iran, North Western China and the Soviet territory Kazakhstan. Most Russian Tortoises found in the pet trade are from the territory of Uzbekistan. Its habitats are dry open landscapes. It is most commonly found in sand and clay deserts with sparse grasses and bushes. Russian tortoises are rarely found in dense grassy areas or cultivated fields (Paraskiv,1956; Kuzmin, 2001). In its natural habitat the Russian tortoise is active only a few months of the year. It comes out of hibernation in mid-March and actively forages and mates until mid-June. During the hottest parts of summer it aestvates. In Uzbekistan it hibernates from October through March. It is most active in the early morning and early evening, retreating to its burrows during the hottest portion of the day. Russian tortoises are most active when the temperatures range 20-32°C (Atayev. 1985). My goal is to have a great reference with links on nutrition, general care and breeding. I have been keeping Russian tortoises since 1991 and	reptiles since the early 60's. I have successfully bred them and currently have a breeding colony of 11 males and 19 females. Please visit the links section for other good sites . Also be sure to go to the site map . It lists more pages than the menu.